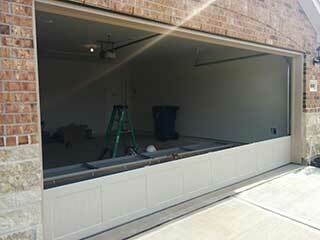 Our professional technicians specialize in fixing automatic garage doors of every make and model. No matter which part of the system is causing the problem, you can count on our specialists to solve it as fast as possible. Over time, your garage door spring will go through a lot of wear and tear. It's unavoidable, as it is in the nature of their operation. When their durability finally gives out and they break, there is a very good chance a part of them will go flying around your garage. If any person stands in the way when that happens, they will most likely get seriously hurt. Because of the high amount of tension these components store inside their coils, even replacing or adjusting them can be extremely dangerous. That's why you should always leave it up to our professional technicians. We have a lot of experience performing spring replacement, and we can get it done both quickly and safely. Both of these components are directly responsible for the smooth and safe movement of your door. If their condition becomes too worse for wear, it can do more than hinder the system's performance. It can cause the door to collapse. Our experts can straighten bends and dents in your tracks and replace any worn out roller with one that would be able to work more efficiently and silently. Your springs aren't the only parts of the system that are in charge of supporting the door's weight and lifting it off the ground. The lift cables are also in charge of that. If they become frayed, they can end up snapping, which can cause the door to drop, or force more weight onto the springs. Needless to say, both of these scenarios are far from ideal. Not to worry, our team can replace your cables before any serious damage takes place, without risking anyone's safety. Don't hesitate to reach out to our specialists at Garage Door Repair Sherman Oaks whenever you find yourself in need of professional assistance of any kind. Contact us today for more information.